Located just a short distance northwest of New York City is Bergen County, the most populous county in the state of New Jersey. One of the wealthiest counties in the entire United States, it is part of the greater New York City metropolitan area with a population of nearly one million, while bordering Passaic County to its west has over one-half million residents. Although neither county features large cities, this widespread, highly urbanized area with its diverse community of residents has long been an ideal location for building car washes. Starting back in the early 1950s, this area witnessed some of the very first developments in the car wash industry. Although cutting-edge back then, most of these washes that are still open today are typically small operations with old buildings and feature out-of-date equipment. Nearly all of them are old-fashioned full-service models with very slow turn-around times, something the local customers have learned to deal with over the years. The customers certainly want more wash options, but with a very limited number of good commercial properties available in the area (especially sites zoned correctly), and heavy competition already in place, very few new car washes have been developed over the last decade. Smart entrepreneurs, however, can find a great deal of success in this area if they have a clear vision of what customers really want (i.e., flex and express models), and, of course, are willing to spend the time and money to do it right. Two such entrepreneurs are Spyros Lenas Jr. and Erion Lenas. First cousins who describe themselves more like brothers, they are long-time businessmen who grew up in the northern New Jersey area. Coming from a family of first generation immigrants, their roots go back to Europe with a mixture of Greek and Albanian heritage. Their field of expertise varies from real estate development and investments, to restaurant operations and management. The family business was originally founded by Spyros’ father, Spyros Sr., who started out as a young immigrant, then catapulted himself into a self-made, very successful businessman. His success was the result of hard work, loyalty, and perseverance as he devoted his life to three things: his business, his family, and helping others around him. He always lived and preached by the golden rule of, “you get out of life what you put into it,” and to this day he still has a soft spot for giving people chances in life by opening doors and granting them opportunity. Time well spent with the “Old Man” over the years has taught the two cousins valuable work ethics and a business foundation that they said no school could ever replace. Starting work at a young age, either in one of the family restaurants or the construction sites of development projects, the duo has learned that, “there are no short cuts in life,” another of the Old Man’s favorite quotes. Very energetic and young spirited, they both have always worked hard so as to play hard. They are family men who like to enjoy life at its fullest. Throughout the years, the family business where Spyros and Erion have spent nearly all of their entire working careers, has developed, owned, and operated many different types of restaurant concepts. The main venture that they currently operate is a very successful Wendy’s franchise with restaurants spread out through northern New Jersey. Their franchise locations have been consistently recognized as excellent operational performers and great brand ambassadors of the Wendy’s system. Their company is the proud recipient of multiple awards and recognitions from Wendy’s — from operational excellence awards, to individual team member excellence recognitions. With a strong entrepreneurial spirit and boundless energy, the two cousins had searched for quite some time over the last couple of years for their next business venture. After conducting lengthy research into the car wash industry, they came to the conclusion that this type of service business would be a great opportunity for them to expand in the same areas where their restaurants are located. Both are now excited and gearing up to begin a new exciting and challenging chapter in their rapidly expanding business ventures. In the car wash industry they see potential in not only developing current real estate assets, but also in raising the bar on an already successful service business. They firmly believe that, just like the restaurant industry, with a lot of TLC a car wash business can be highly sustainable, profitable, and here for the long haul. Their mission going into the car wash industry is simple: great “QSC,” meaning give the customer great Quality, with great convenient Service, and a whole lot of Cleanliness. Although they took this one right out of a page of Wendy’s founder Dave Thomas’ successful business mind and legacy, they do realize that it is the only way for any service-oriented business to truly succeed. They also realize that they cannot accomplish all of this by themselves. Just like with the restaurant business, it’s all about people and you need to take good care of them. Years of management experience have taught them that business is like a team sport. In order to have a winning team you need a good recipe. That recipe starts with a great coach who selects great players, takes care of them and trains them each and every day to make them better than any competing team. That’s the recipe that puts you in first place every time. Spyros and Erion’s starting point to get into this new business was to first find the right wash equipment manufacturer, one with high-quality equipment that they could truly rely on and with good long-term support to help maintain it. After doing their research and interviewing several companies, they finally decided to go with MacNeil Wash Systems. Their next step was to select an architectural design firm for a project that needed to take on highly competitive markets and succeed. They appreciated our design philosophy: creating car wash designs that are highly functional with great traffic flow, but still possess abundant street appeal with enough eye-candy on the building to get the customers in the door — and doing it all without breaking the bank. The two cousins plan on building up to 10 locations in the northern New Jersey area, if of course they are able to locate enough good sites that also have the proper zoning and ability to receive city approvals. The very first car wash site they selected to develop was a property that they already own, located in Elmwood Park. This heavily urbanized borough is in Bergen County and some 12 miles northwest of New York City and Jersey City. Overall an excellent site for a car wash, the property is located next to the Garden State Parkway on Route 46, just south of U.S. Interstate 80, and adjacent to an old railroad track spur. They had previously built one of their Wendy’s restaurants on this site, but had quite a bit of leftover land (approximately one acre) to further develop in the future. Unfortunately, the remaining area was triangular in shape, making it somewhat difficult in laying out an efficient and functional car wash design. It also limits the length of the conveyor. But before we addressed that, the first step in the design process was to determine what type of wash to build. Listening to residents in the area, Spyros and Erion realized that their potential customers wanted what all other car wash customers want throughout the rest of the country: large, attractive, very clean, and well-maintained car wash facilities with outstanding top-of-the-line equipment, superior customer service, and very quick turn-around times. The perfect solution was to develop flex and express-type car washes, with the type selected at each location based upon population, demographics, and available property size. With that direction firmly established, we attempted three different design layouts on this first, very difficult-shaped site. Each of these layouts had a few advantages over the other two, but after weighing all of our design options, one clearly won out in the end. 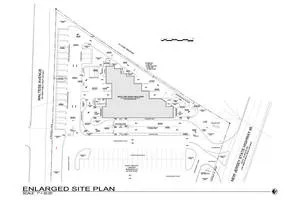 Wanting to maximize the site area, the final building design would have to match the triangular shape of the site. The design we chose placed the stacking along the south side directly facing the Wendy’s restaurant, with its entrance right at the existing single curb-cut going into the site. This would make the most efficient traffic flow for customers. We could fit only two fully covered POS lanes (with RFID) in the design with a total stacking capacity of 24 vehicles, but for this site it should be sufficient. The only flaw of this layout was having to make a 180-degree right-in turn to get into the wash tunnel. We eliminated this issue by adding an extra eight feet to allow vehicles sufficient space to straighten out prior to mounting the conveyor. We were able to squeeze in an overall conveyor length of 121 feet, all located inside of the wash tunnel due to cold weather concerns, with an easy left-turn out. Driveways were placed along the other two sides following the property lines with the building sitting in the center of the site, since zero-lot lines were not an option due to setbacks. However this layout did allow excellent and highly controlled traffic flow around the facility. After exiting the wash tunnel, customers can enter any one of the three interior drive-thru bays for full-service and detailing services, with an internal capacity of 10 vehicles (with ability to stack outside of one per bay at the entry and two at the exit side). Customers who opt for this service can continue over to the other side of the site where the 16 free-vacuum spaces are located. There will also be five employee parking spaces and a handicap space on site (other employees will park at the large adjacent Wendy’s parking lot). The exit of the wash facility is located at the south end of the free-vacuums spaces, at the extreme end of the property. 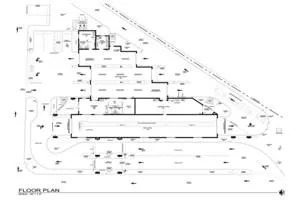 Besides the wash tunnel and three interior bays (detailing center), there is also a very large customer lobby, customer restrooms, and an office grouped together along one side inside of the building. The other end has a large towel cleaning room, employee break room, and employee restroom. Overall, the interior building layout is an efficient and functional design with literally no wasted space anywhere. In all interior rooms the ceiling heights are very high and spacious, with loads of large windows to allow views of both inside and outside to observe all of the action. The overall design of the exterior was a clean and modern geometric look with lots of interesting wall façade articulation. The most interesting feature of the building and its focal point is where the two sides facing the site entrance come to a sloped sharp point, one overlapping and intersecting the other, with several thick columns underneath. It is on these two raised and angled façades that signage will be installed. The overall façade will feature a recessed painted pattern of rectangles. Large decorative metal sunshades will be installed over all unprotected doors and windows. The building will be primarily constructed out of concrete block, both inside and out, with a flat steel built-up roof and raised concrete block parapet. Finally the four central vacuum units will be housed in two exterior concrete block enclosures, one for the inside bays and the other for the free-vacuum spaces. Once this first location of their new car wash chain is opened, Spyros and Erion will be developing numerous other sites throughout the northern New Jersey area at a very rapid pace. We have already designed a more compact and residential-friendly expresscar wash version for another smaller property they own in a nearby city. It has already been submitted for planning and zoning approval. This high-low mix of washes will be the cousins’ recipe for success. If the long-term success of their Wendy’s restaurant chain is any indication, their new chain of high-quality, up-scale car washes should prove to be extremely successful as well. Christopher Crawford is with Car-Wash-Architect.com. He has written a number of major articles for this magazine over the years concerning the design and construction of new car wash projects. You can visit his company’s website for more information about the services they offer, or call them at (561) 212-3364.